Fall may be coming, but wages are on the rise! Employees in three Canadian provinces (Alberta, Manitoba, and Saskatchewan) can look forward to a minimum wage increase on October 1. We here at CPC are still hard at work updating workplace posters for two of those provinces, but employers can now purchase the Saskatchewan All-On-One Labour Law Poster fully updated for 2018. The poster has been revised to reflect the upcoming October minimum wage increase and expanded information on job-protected employment leave. Effective October 1, 2018, the minimum wage for Saskatchewan will increase from $10.96 per hour to $11.06 per hour. The 10-cent increase takes Saskatchewan from the lowest provincial minimum wage to the second lowest, rising 6 cents above Nova Scotia’s. Since 2011, Saskatchewan’s minimum wage has been adjusted each year for increases to the “all-items” Consumer Price Index (CPI) for Saskatchewan, while also taking into account the average hourly wage for the previous year. Although some have called for a more accelerated minimum wage increase, supporters of the current formula argue that the slight yearly increases create consistency for employers and promote job growth. 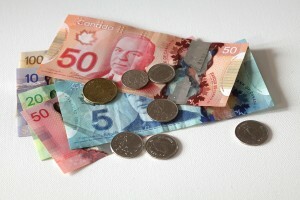 The Minimum Wage Regulations in Saskatchewan posting on the Saskatchewan All-On-One has been updated with the new minimum wage rate and effective date to ensure that employees are informed of their rights under current regulations. The Leaves of Absence Under the Saskatchewan Employment Act posting has also been updated to provide more information about the types of job-protected employment leave which are available. Employees who have been employed by the same employer for 13 consecutive weeks are eligible to take unpaid leave for specified family, medical, and service purposes. In 2017, Saskatchewan added a new type of employment leave to the list. Interpersonal violence leave provides employees who have been the victim of interpersonal violence, or whose child or dependent has been the victim of interpersonal violence, may take up to 10 days of leave to seek medical attention, obtain services from a victim services organization or psychologist, relocate, or seek legal assistance. Leave may be taken in shorter blocks of a few hours or in longer blocks of several days. Labour Relations and Workplace Safety Minister Don Morgan said the leave was necessary because “Saskatchewan has one of the highest rates of police-reported interpersonal violence across Canada.” Interpersonal violence leave will allow survivors to look after their health and safety without endangering their abilities to support themselves. The Leaves of Absence Under the Saskatchewan Employment Act posting as also been updated to provide information on injury and illness leave under provincial law. Although not formally considered a type of employment leave, employees are entitled to job protection if they miss work due to their own or a family member’s injury or illness. Employees with a short-term illness can be absent up to 12 days in a calendar year, while employees with a long-term illness can miss up to 12 weeks in a period of 52 weeks. 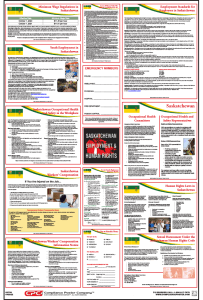 WHY DISPLAY the 2018 Saskatchewan LABOUR LAW POSTER? Although Saskatchewan does not mandate the posting of American-style informational notices, many employers prefer to display informational posters alongside legally-mandated postings to ensure that employees are fully informed of their rights and responsibilities without having to page through complicated legal text. For those employers, CPC has created the Saskatchewan All-On-One ™ Labour Law Poster, part of our unique line of Canadian Labour Law Posters. The Saskatchewan All-On-One Poster comes with a sectioned companion poster which allows employers to easily track and post the copies of laws, regulations, and internal policies which are required under provincial law. Informational notices and posting reminders are also available as a Saskatchewan Mobile Poster Pak for easy desk reference or mobile work sites. Please keep in mind that we are unable to provide legal advice.